LibTTScan - to show Artifact Power amount on mission rewards. GMM - Load On Login - to make GMM load on login and make all its features available right from entering the game instead of delaying load until you interact with Blizzard UI. The core of GMM is team selection: mission list will have one button and individual mission page will have top 3 buttons at Battle for Azeroth mission table, Class Hall, Shipyard and Garrison. Clicking any of those button set suggested team. Each button will show you success rate along with icons of bonuses gained by that team or reduced time. Hovering over those buttons will show tooltip with suggested team. GMM checks all combinations of all followers and selects those that give best total success chance reported directly from WoW. This takes care of each and every trait and ability your followers have, present and future, without any need for special updates. After GMM is loaded (i.e. you've opened any garrison interface or landing page at least once), right clicking the minimap button will show WoD garrison/shipyard landing page even if you already have Class Hall. (Just like all other feature this requires GMM to be loaded - i.e. you need any garrison interface or landing page at least once or install GMM - Load On Login). A second set of 3 more buttons will appear on missions offering material (GR/Apexis/Oil) or gold rewards, showing best choices for maximizing those resources, sacrificing other optimizations like using lowest possible followers. Those teams are also optimized for long term gain - i.e. you could have lower success rate on individual missions, but your material/gold yield will be better on average over time. GMM will not suggest fully maxed teams on missions that only grant XP as long as you have unmaxed followers. If you don't have salvage yard and only have fully maxed followers GMM will not suggest teams for XP missions at all - this will be indicated by empty suggestion buttons on such missions. However when all your unmaxed are busy and if you do have salvage yard, GMM will send remaining maxed followers on those missions as well to allow you to hunt for salvage crates. This mode is indicated by salvage bag/crate icon appropriate for mission. GMM will also check busy followers - those working, on mission, deactivated or otherwise unavailable right now. A set of 3 more "disabled" buttons in lower right corner will show best teams considering every available follower. Tooltip for those buttons will show currently unavailable followers in red and will show their status and remaining time if they're on mission. GMM adds a top team button to each mission on mission list page in both main garrison building and naval mission table in your shipyard so you can see at a glance which missions you could reliably do with your current followers. Clicking this button will take you to mission page and automatically sets suggested team. Mission expiration time will be shown in lower left corner of each mission's button. Since XP-only missions don't present any unique rewards, they won't be tracked to reduce clutter in UI, except for rare missions that offer huge rewards with low level requirements. Time on missions with less than 8 hours remaining will be shown in red. You don't really want to know that all your item level missions are level 100. Item level on such missions will no longer be tucked in parenthesis below big 100, but will instead just replace level 100 indicator completely. Item levels will also have a slightly brighter color to make those missions stand out, as they usually offer better rewards. Missions that require more followers or garrison resources than you currently have will be dimmed out to let you concentrate on missions that you can do. Followers with appropriate profession traits can boost working orders in production buildings. Since patch 6.1, follower must be in the building at the moment when each individual order completes to boost output. When you add a follower to the party on a mission screen a warning will appear bellow follower's portrait if you have appropriate building where he can work so you won't accidentally send on follower on a long mission that you wanted to put in a building. If there's no orders in progress, warning will be shown in yellow with just a name of building. If there are orders in progress, warning will be in red and will show time until next completed order and number of remaining orders in addition to building's name. GMM adds buttons at garrison architect table that will allow you to automatically mass-assign all available workers to buildings or mass-remove them. Note that Blizzard throttles follower assignment/removal, so it could take a second or two to finish. Be sure to wait for buttons to switch states and usual follower assign/remove click sound before leaving architect table. GMM will always prefer the best follower for building - that is, with highest level available, because that influences actual yield and will not select lower level followers when higher level follower is busy. If you have several same level followers, GMM will select free follower with lowest ilevel. Tooltips on the buttons will show which follower will be added/removed from each building. If best intended follower is not available - e.g. on the mission, it will be show in orange on assign button tooltip. Buildings that have a slot but don't have suitable followers at all will be shown in red. If you have any display addon that supports LDB modules - e.g. Titan Panel or FuBar - GMM adds a module that for now will show list of buildings with followers both as icons on panel and tooltip similar to that on mass "Remove" button to help you quickly asses if your follower is working in those buildings that don't have readily visible indication like Lumber Mill, Garden or Mine or to remind you that some of your followers are assigned when you're hanging at mission table. The tooltip will also include list of buildings that you have no followers for in red. Note that GMM only loads on-demand with Blizzard's garrison UI, so you won't see display or even module itself listed in available modules list until you load garrison UI by interacting with any garrison facility - e.g. mission or architect table. You can also simply click "garrison report" on your minimap to load it. When you access ship builder, you'll see a number of each type of ships you have in chat window, so you can quickly decide what to build. GMM aims to be fast and lightweight, keeping CPU and memory use to the minimum, requiring no configuration and generally just doing the right thing with a single click. This is still the best mission addon out there. Please look into updating it! Maybe rename it "Mission Manager" in order to move forward with this feature which seems to be staying forever in WoW. When updating, remember to include the cost of troops especially since Argus content, since the 3 followers from there are quite expensive (also include the more expensive followers specific to each class). Even if having to manually fix it during Legion, it was my addon of choice. Please consider keeping it and thanks for the great work! Anyone got replacement addon to recommend that will work for BFA? Would really love an update on this. I use this daily both in my garrison, AND in my order hall for the percentages choices. Currently got several LUA errors listed below. 3x ...ns\GarrisonMissionManager\GarrisonMissionManager-v55.lua:160: Attempt to register unknown event "GARRISON_BUILDINGS_SWAPPED"
(*temporary) = "attempt to index upvalue 'gmm_buttons' (a nil value)"
I hope this gets updated, I'll still be using my garrisons for forever..
Is this add-on abandoned? It doesn't work in 8.0.1. Whats wrong with the update? 13Feb2018 and game version 7.2.5? One baffling concept of this addon is why, if one is trying to conserve resources and still reach the maximum %, it wants to put the most precious resources into play rather than the minimum resources into play. For instance, it will try to fill all the slots with back line troops which cost the most to replace rather than trying to use the least number and expensive back line troops. Why does it even use back line troops if the mission can be 200% using just one companion and no back line troops? This just seems to be counter productive to what I thought this addon was attempting to provide. Great addon, I only wish it would have the option to always prioritize minions over troops. It never does this, it always seems to favor troops over your minions even if they will die from it. Hoffe auch, das es bald ein update dieses Addons gibt. Trotzdem hoffe ich an erster stelle, das es dem Entwickler gut geht. Solange sollten wir, unser eigenes Köpfchen Anstrengen. Also hope that there will soon be an update of this addon. Nevertheless, I hope in the first place that the developer is good. As long as we should, our own head effort. Can you please update this addon? 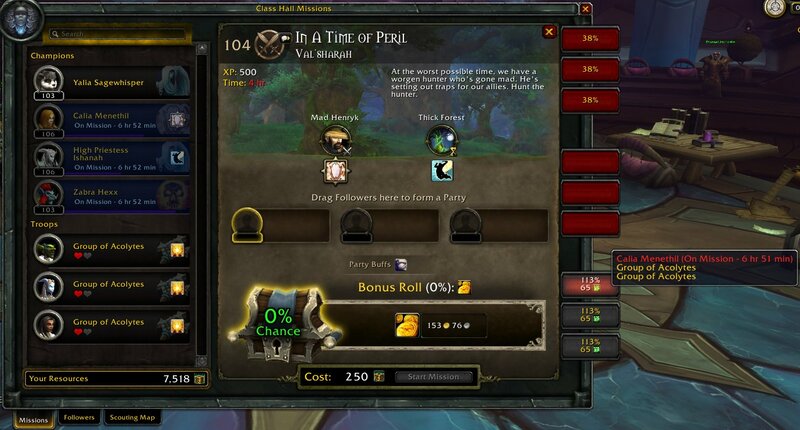 It's a very helpful addon that makes doing follower missions quick, easy , and efficient.